What happens in a Normal Year? What happens in La Nina Year? What happens in an El Nino year? How does El Nino affect Indian Monsoon? Will El Nino 2014 hurt Indian GDP? Do we really need to fear El Nino 2014? Arguments: why we don’t need to fear El Nino? Arguments: why we should worry about El Nino? This is an old article from Current Affairs from April Week3 (16th to 22nd). I’ve updated it further with points from Economic Survey Ch.8 on agriculture to create a separate standalone article. UPSC General Studies (Mains) – Answer following in 200 words each. 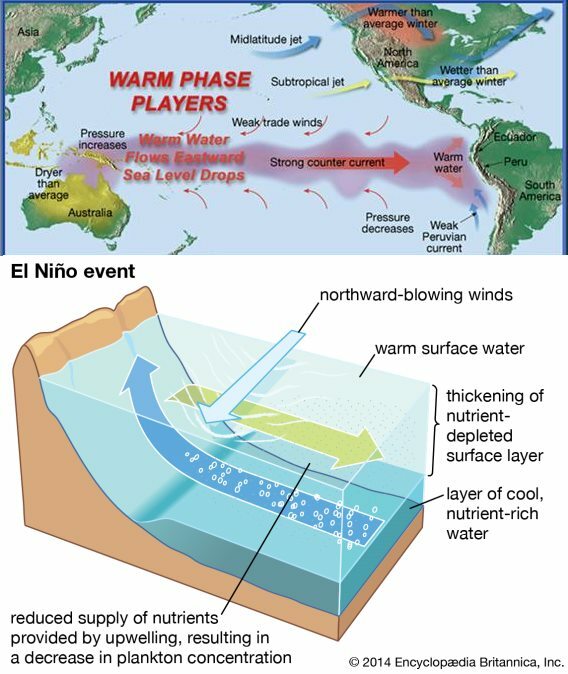 (GS1) What is El Nino? How does it affect India and World? (GS3) Discuss the structure and functions of Biodiversity Management Committees under Biodiversity Act 2002? Evaluate their success in India. The fear about El Nino on Indian Economy is overhyped. Do you agree? Peru Current = Humboldt Current = Cold Current. This air also joins walker cell and begins descending near Peru. Descending air = anti-cyclonic condition = high pressure = stability = no cloud/rain = Drought in Atacama Desert. below the water Moving of water from Peru to Australia. @Peru cold water upwelling brings nutrient to surface= more lunch for Plankton= more fishes = good for Peru fishermen. above water Moving of air from Australia towards Peru. Warm water + low atmospheric pressure = good rainfall over Australia & Indonesia. Too much rain / flood over Australia and Indonesia. As result, cold water is not dragged from Peru to Australia. But reverse happens – warm water is dragged from Australia towards Peru. Consequently, warm water + low pressure condition develops in the Eastern Pacific (Peru) and Cold condition + high pressure in Western Pacific (Australia). Drought @Northern Australia, Indonesia- even bushfires. Storms and Hurricanes in East Pacific. 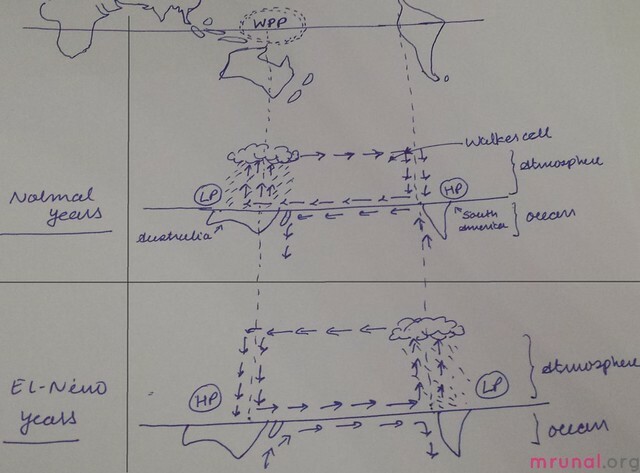 (for MCQ) El Nino decreases earth’s rotation rate, decreases Coriolis force and increases length of day. (La Nina creates opposite). How? Because El Nino changes the wind pattern, hence Earth needs change speed to conserve its angular momentum of Earth-Atmospheric system. Near Western coast of Peru and Ecuador. Occurs @every 3-4 years; [In theory, it should occur @every 12 years]. Its impact usually lasts for 9-12-18-24 months. It weakens the trade winds and changes in Southern Oscillation, thereby affects the rainfall pattern across the world. Between the eastern and western hemispheres. Impact of Southern Oscillation (SO)? But the wind movement is part of larger atmospheric circulation hence affects the rainfaill over India. But how? Towards Peru coast = this affects rainfall in South America. Towards Mascarene High Pressure zone near East Africa. 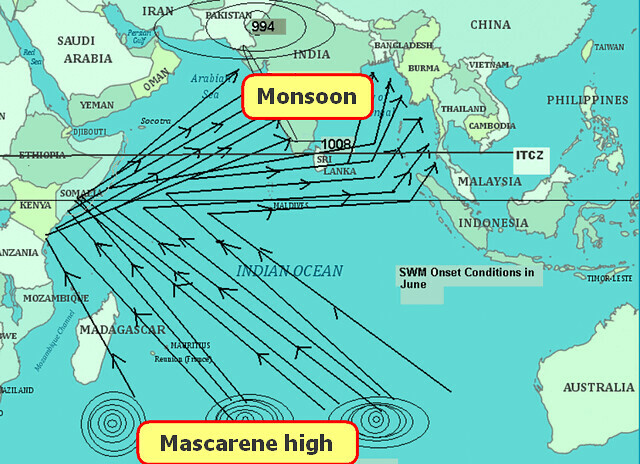 = This affect Indian monsoon. Less rainfall / weak monsoon. During La Nina years, this push is even stronger = heavy rain and floods. El Nino caused severe drought in India (2009-10). Sugar price were highest in 30 year history. El Vejo= old man, but La Nina more popular term nowadays. Such condition prevails for 9-24 months. India Meteorological Department (IMD) has predicted “below” normal monsoon for 2014. Poor monsoon / drought like condition = commodities prices will rise especially sugar, pulses and edible oil. Government needs to stock them up, put restriction on exports, before black marketers start hoarding. Farmers need to device alternate farming strategy, change the seeds and irrigation strategy for the drought like situation. Area without irrigation, and totally dependent on monsoon. Western India region especially oilseeds, pulses and cotton=> high cost of raw material will have negative impact on their manufacturing sectors also. Area depending on Ganga for irrigation. Because so far Ganga’s water is above its 10 year average. Oilseed and pulses- will have to import them. if inflation declines=> RBI will reduce repo rate=>cheaper loans=>more business expansion =>more GDP. To combat inflation, RBI will further increase REPO rate (OR RBI will not decrease REPO Rate) => either way expensive loans => less business expansion => low GDP growth. answer is both YES and NO. Only “Strong” El Nino affects India negatively. But this time WMO predicted “Weak” El Nino. Private Weather Agencies predict only 30% chance of El nino. Not Every El Nino year caused drought in India in the past. Under British Raj and even in 50s era, a drought under El Nino = Millions would die in starvation and suicide because of moneylenders. But that’s not the same India we live in today. ~40% of the farmlands are irrigated; FCI has large buffer stock of foodgrains; Government has sufficient money to announce financial packages to drought hit farmers; RBI has sufficient Forex reserve to finance any emergency food imports; we enjoy goodwill among all developed countries for even food-aid free of cost. Only IF terrorists blowup all FCI godowns, Black maketeers hoard every last gram of remaining onions and foodgrains, RBI’s forex reserve gets completely empty because of Fed Tapering…..THEN and only THEN El Nino can create havoc on India. El Nino Southern Oscillation = natural phenomenon for redistribution of excess heat. Humans cannot control or modify this cycle. In theory we can stop El Nino by dropping 10m thick iceberg size of a United States, into the Peru coast- but that’s impractical. So, Instead of fearing El Nino, we must learn to predict and adapt to its consequences. Even if El Nino doesn’t happen, the mere rumor of El Nino drives up the prices in commodity market because of the speculative investors. For example, global prices of Cocoa are high right now- not because of less production but because of El Nino speculation. Australia- second largest export of wheat they’re already facing drought because of Pre-El Nino type condition. US Midwest =called “Granary of the world” for wheat and corn. But they too face flood danger from El Nino. India is second largest producer of sugar, rice and wheat in the world. 90% of Rice comes from Asia. Erratic Rainfall, melting of Himalayan glaciers, frequent flooding, draughts, storms and cyclones => Food insecurity for large population. United Nations’ World Meteorological Organization predicted a “weak” El Nino by the middle of 2014. Then India will be worst affected because of low monsoon during June- September. Then India will escape without injuries. 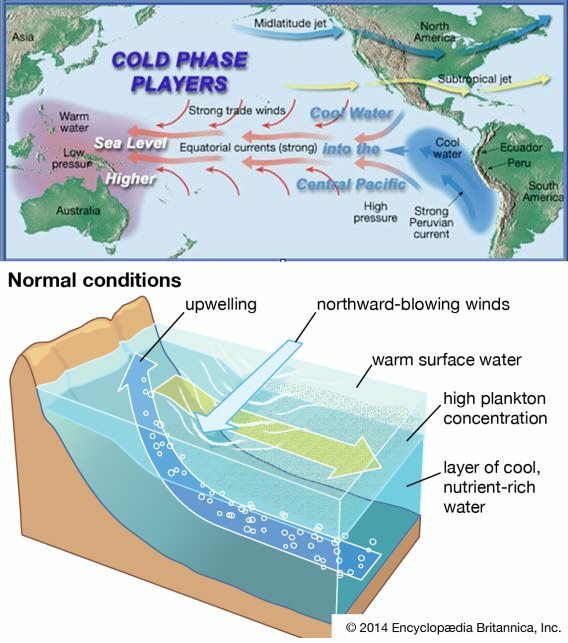 El Niño effect occurs when surface temperatures in the Pacific Ocean continuously rise above average for several months, which in turn adversely affects weather in many parts of the world. El Nino occurs every 3-5 years. South-west (SW) monsoon (from June to September) accounts for ~75% rainfall. Any shortage here. El Nino often begins to form during June-August, and typically lasts 9-12 months. Maharashtra, Gujarat, Rajasthan, Karnataka, Jharkhand, and Bihar. rice, soybean, cotton, maize, jowar, groundnut, and sugarcane will be affected. But 2002-03 was the only year that India showed negative agri sector growth with average rainfall dropping 20 per cent below normal. The last four occurrences of El Niño reveals that the impact was more in the kharif season. Government has placed contingency measures in about 500 districts. Central Water Commission (CWC) reflect a better status of water availability. El Nino is an Oceanic and Atmospheric phenomenon that leads to unusual warming of water in the Peru coast. Since Pressure is inversely related with amount of rainfall, El Nino causes draught situation in Australia and South East Asia. El Nino also leads to reversal of pressure difference between Indian and Pacific Ocean- known as Southern Oscillation. El Nino Southern Oscillation (ENSO) weakens the Trade winds, consequently less push to the South Western Monsoon Winds from Mascarene High to India, and therefore poor monsoon. Drought condition decreases the agriculture output, leads to food inflation. Declined supply of cotton, oilseeds and sugarcane negatively affects the textile, edible oil and food processing industries respectively. Drought situation over South East Asia and Australia hurts rice and wheat cultivation respectively. Warm condition over Peru coast: unsuitable for Plankton population, thus bad for fishing industry. Birds migrate in search of fishes, thus less guano dropping for Fertilizer industry in Peru and Ecuador. Flood situation in South America & US Midwest lead to decline in coffee-cocoa and corn-wheat production respectively. ans simillarly low index means El nino. GRT WORK FOR UPCOMING ADMINISTRATORS AND NICE, SPECIFIC EXPLANATION. Such a wonderful and amazing work ji..
Really important sir.. i just revise your Articles on the related topic or exams..thank you sir..
in gs-3 attemt 80 marks question from the hindu or mrunal …feel proud to be the reader of mrunal.org……………..
Sir i have a doubt…. 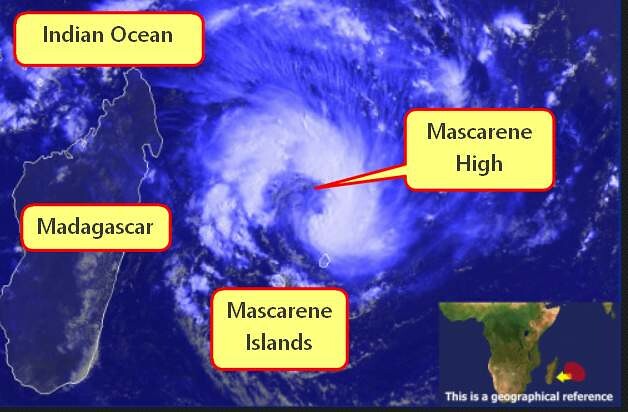 plz refer any previous article that can b read before dis article to have a better undtstnding of dis article..plz help as m new to geography..
sir,how mascarene high affects the sw monsoon? No one can write such a crisp article. Still relevant and useful after 4 years. Above water–Air moving from Australia to Peru. It is misleading. Plz check. sir i have started the preparation of upsc cse at home without coaching coz my family can’t afford it….. i’m reading ‘the hindu’ from 2-3 days….but i’m so much confused about making notes of the hindu….should i make notes on soft copy or hard copy ???? how can i remember important articles of the hindu till the mains ??? ?